Implementing the Common Core Standards for Mathematics requires collaboration to strengthen teaching and learning. The WestEd/SVMI Mathematics Network* supports educator leadership teams preparing all students to be college and career ready in mathematics. 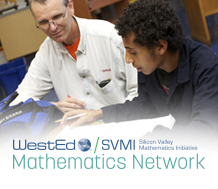 Visit the WestEd/SVMI Mathematics Network project page to learn more and download the flyer. * The Network is a partnership between WestEd and the Silicon Valley Mathematics Initiative (SVMI).